Windows 8 Operating System allows users to download & install free and paid apps from their official Windows 8 store, which hosts thousands of apps especially designed for Windows 8. These apps store various personalized data, settings and progress levels in case of games apps users. Risk of losing apps data due to virus, Trojan horses attack, can’t be denied and could prove vital to users. Also Windows 8 OS allows users to restart your PC or start over completely, by resetting system settings to default and deleting all apps, in case, system is not running well. You would lose all apps data and settings if you decide to format your system and re install Windows 8. It would be hard for users to locate the individual app data and manually back up its data. 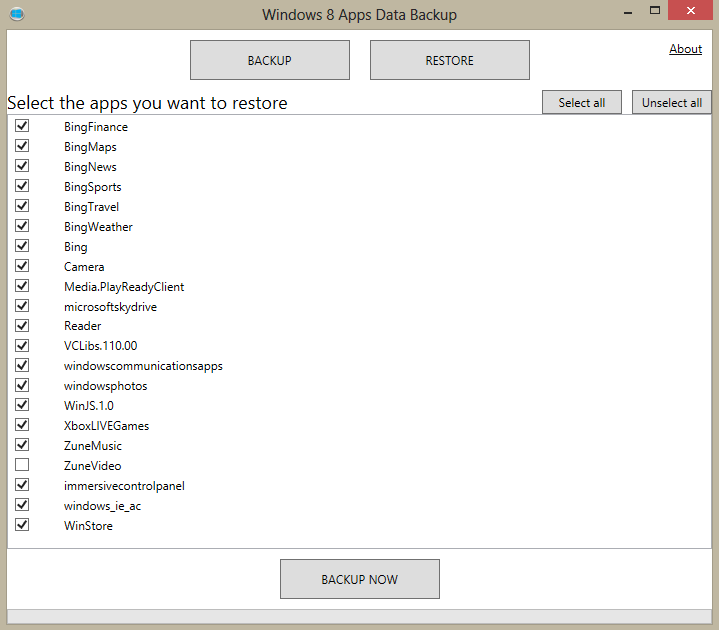 A free utility called Windows 8 Apps Data Backup allows you to easily backup and restore apps data. 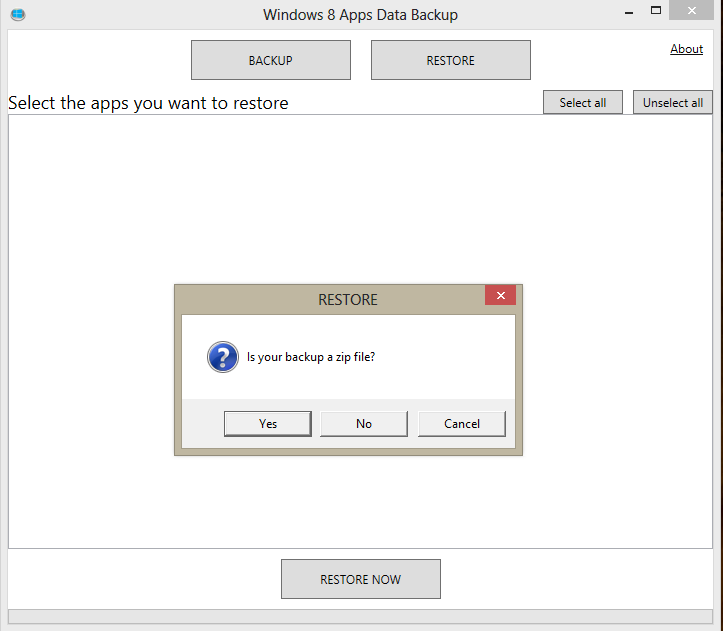 To download Windows 8 Apps Data Backup utility Click Here. This utility requires no installation and very easy to use in backing up and restoring Windows 8 apps data. The only thing you need prior to running this application is, make sure your system has .NET Framework 4.5 installed else you need to first install it. To get the .NET Framework 4.5 Click Here. 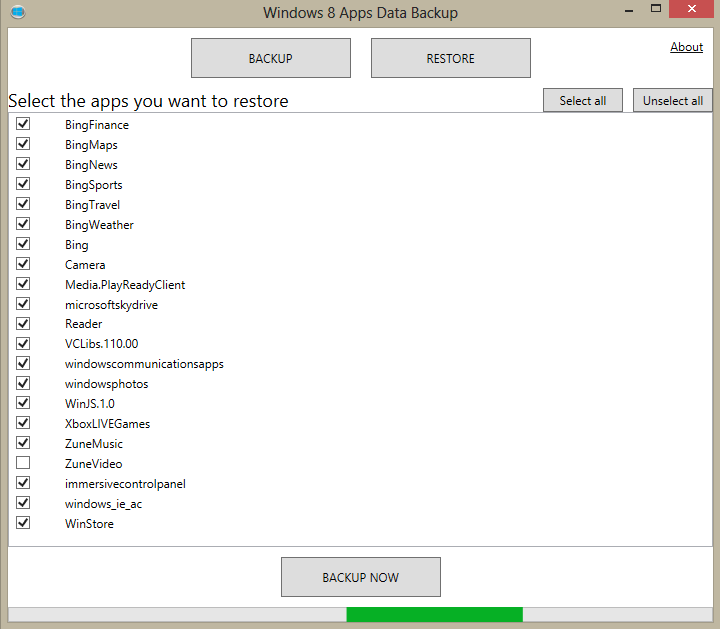 - On the Windows 8 Apps Data Backup Window, click on “BACKUP” button. - It will present you the list of all the applications installed on your Windows 8 system. - Click “Select all” button to select all apps for backup else choose the individual app in case you don’t want to backup all apps. - Once done, click on “BACKUP NOW” button to proceed further. - The utility will ask you whether you want to compress the apps backup data in zip folder or not. It is recommended to click yes, as it will occupy less space on hard disk and you can easily save it on your USB drive or external drive. - Also select the location where you want to save your backup data. - A confirmation message will be displayed once the process is complete. - First re-install the apps from Windows 8 store. 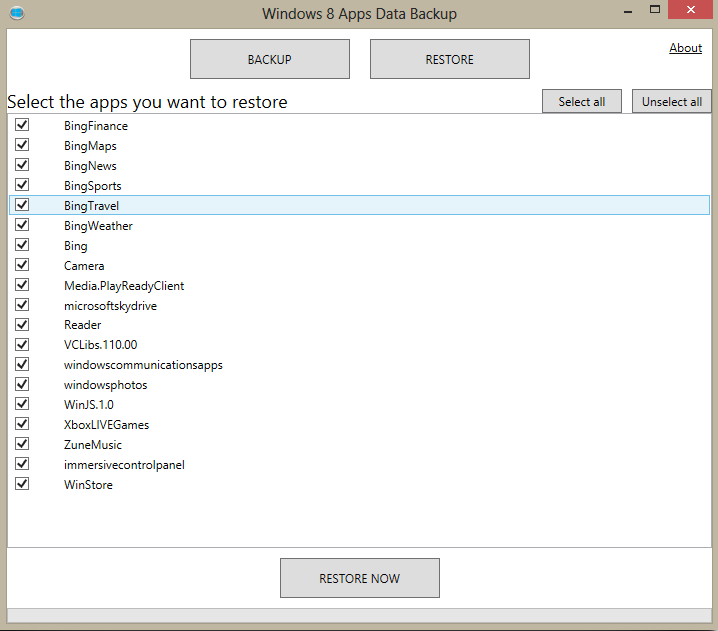 - Now open the Windows 8 Apps Data Backup utility. Don’t forget to close all apps before proceeding further. - Click the Yes or No button accordingly. - On the next screen, browse the location where you have saved the backup (in case of zip file, select the zip file else select the folder where backup is saved) and click OK button. 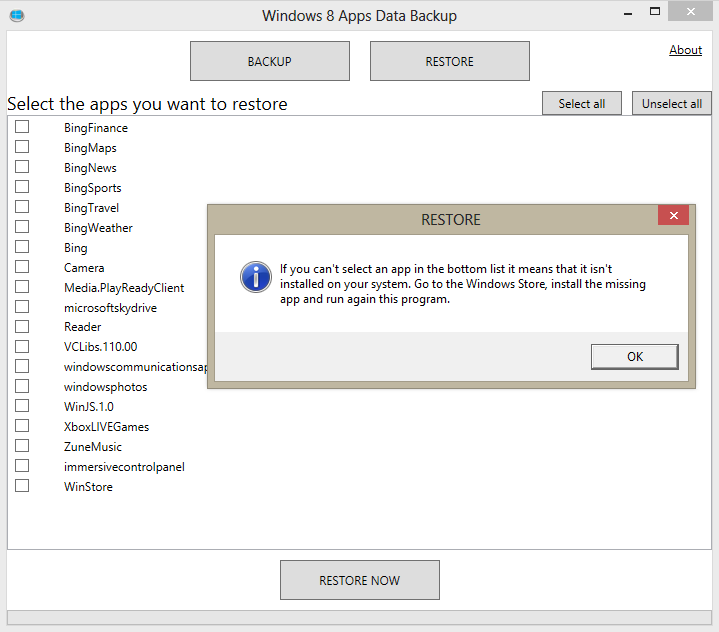 - In case you are not able to select apps in Restore Window, then it means that app has not been installed on your system and you need to install it first from Windows store. - A confirmation message will be displayed at the end. Note: Due to technical reasons, Windows 8 Apps Data Backup utility does not guarantee cent percent data recovery and may not work as expected in some cases. I need free updates for drivers and free antivirus protection for Windows 8.